Packing Up Again - Family Times is an award-winning magazine with staff-written news, feature stories and artwork that inform and inspire Central New York parents and their children. A recent session with an 8-year-old client highlighted a post-divorce reality for many kids: moving between two households. She talked about how difficult it was to remember to take her belongings with her as she went from one household to the other. She had left part of a school project at one parent’s house and had to duplicate the work at the other parent’s home. Nearly 1 million children experience divorce in their family each year. Many of those children will move between Mom’s house and Dad’s house as part of a custody-sharing agreement. And while having involvement from both parents is good for children, all that moving around brings its own challenges. Transitioning from one household to the other can be stressful for kids. Each household has its own set of rules and expectations, not to mention location of plates and silverware. It’s a lot to keep track of. Our work has allowed us to speak with hundreds of kids and parents over the years about transitions between households. Here are two things mentioned most often and some suggestions for the parents. 1. Managing belongings. One of the most common issues is how kids manage their clothes and other items. Packing up and moving your stuff from one house to the other on a regular basis is a real pain. In some cases, kids hear from parents “I bought you that shirt/shoes/toy, it stays here.” On “moving day” kids have to sift through their stuff and sort out what is to stay and what is to go. Having to remember which parent bought what item and keeping it in the respective household only complicates the task. 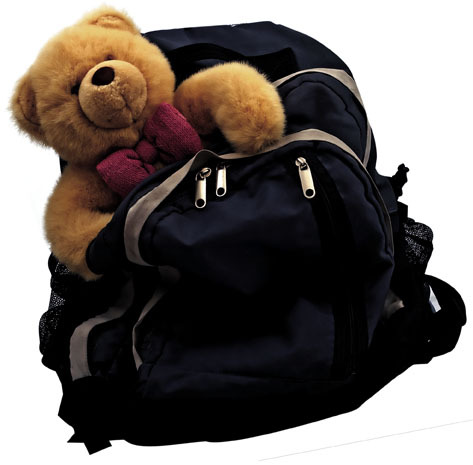 Generally speaking, if a personal item was purchased for the child’s use, it should go where the child goes, particularly in the case of clothing. What’s the solution? Duplicate when possible. Having what they need at each household makes things easier on the kids. Personal care items like shampoo, deodorant and toothbrushes should be at both houses. The fewer things they have to cart back and forth, the better. Things will get left behind, and parents should accept that. Even the most organized kid will forget items from time to time. To cut down on everyone’s frustration and trips across town to retrieve clothing or homework, develop checklists. This is especially helpful for younger children. They can check their list to make sure they have their backpack, homework, favorite pillow and so on. When your child does forget something, try not to complain. Work together to come up with a retrieval plan. Can you return to get it? Can it be brought to work or another location the following day for pickup? Even if the item doesn’t seem important to you, it is important to your child. For some children, having the same items with them at each household helps them feel grounded and secure. 2. Routines and consistency. In short, routines and consistency matter. When there is consistency between Mom’s house and Dad’s house, we see children make much faster, healthier adjustments to divorce. This means parents have to work hard to work together in parenting. The more similarities between the two households, the easier it is for kids to navigate between them. The same bedtime, homework time and chores make remembering what to do much easier. Establish a transition routine. Even when the two households share much in common, it can be stressful for kids to transition back and forth. Having a routine is helpful. The day and time should be consistent. Have an established routine for when they re-enter your household. For younger children, perhaps a “welcome back” snack where you both sit at the table. For older children, allow them time in their rooms or hang-out areas. Kids don’t always like doing something right away when they have switched households. They may need some time to get their feet under them. Part of the routine should be some downtime prior to moving on to the day’s activities. As parents, try to put your child’s needs first when possible. This requires communication and cooperation between parents, working to set aside adult relationship issues. Divorce presents challenges for children and their parents. The Mental Health Association of Onondaga County offers a program called Children 1st! (http://www.mha-oc.org/children1st.html), a six-hour class for parents involved in divorce, separation or custody disputes. Certified, trained professionals cover topics including adult emotions and psychology, children’s emotions and psychology, and the legal process and alternatives. Children 1st is certified by the New York State Parent Education and Awareness Program. If you need individualized help for your family, a psychotherapist who works with these issues can also be a valuable resource.